Imperfect Polish: Weekend Wish: Is Spring Here Yet? Weekend Wish: Is Spring Here Yet? A chambray blazer from Acne is perfect for layering and a great alternative to my usual black. The Missoni skirt is so sweet with its scalloped edges and pastel colors. 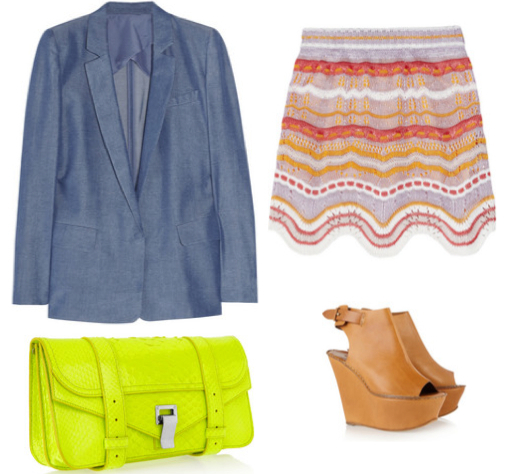 Loving the neon yellow Proenza Schouler snakeskin against the more muted tones. And these Chloe wedges are the perfect wedge with this look or with cropped pants, denim or a maxi dress. My weekend wish is that it will not feel like long until I can put this all together and enjoy some warm weather, looking cute, and with a new sidekick that won't spit up on it. Lots of wishful thinking there, especially the spit up part. A burp clothe would look great with that blazer.